Bashirov V.D., Korotkov V.G., Sagitov R.F., Vasilevskaya S.P., Voloshin E.V., Utyaganova Z.Z. Abstract: Currently in Russia great attention is paid to the disposal and recycling of industrial and domestic waste. In various industries at the present time is accumulated and not recycled, a huge amount of waste. The bulk of food production waste (brewer's grain, distillery stillage, husks), or simply drained, in connection with impossibility of the enterprise to process or used as fuel (husk). If we talk about the timber industry and its wastes (chips, shavings, sawdust), you should also recycling these wastes are not. This may also include and waste polymer materials, which every year becomes more and more. The relevance of the use of waste food and wood processing, plastic industries, construction materials and articles associated primarily with the problems of preserving the environment - they are not subject to rot, corrosion, but also with the problem of resource conservation. Currently, widespread use of waste polymers in building materials industry, is also quite acute problem is disposal of waste food and wood processing industries are Particularly promising direction of recycling is obtaining highly filled plastics that can be used as composite construction materials. A promising method of obtaining high-quality extrudate is extrusion process using a single screw press because of the simplicity and reliability of its design. Despite long-term use of screw presses for the production of multicomponent mixtures, especially for highly filled plastics: technological forming process is studied in them is not enough, there are no universal methods of calculation of screw presses for production of highly filled plastics, so the research and study of the extrusion process in screw presses is important and promising. Keywords: extrusion, household waste, industrial waste, auger, highly filled plastics. In various industries of Russia now accumulates and is not a huge amount of waste recycled. The bulk of waste — waste chemical production, in particular polymeric materials. Collection and processing of polymeric materials are not properly carried out, all polymer wastes accumulate in landfills and have a long period of decay. In the Orenburg region waste petrochemical industry also constitute a significant segment in the field of waste resulting from the activities of this group of enterprises. Sufficiently strong argument for the speedy and complete as possible recycling is that, as a rule, are highly toxic petrochemical waste and pose a serious threat to the environment [1,2]. 2) thermal method of disposal. The second method is used mainly in industry hi¬micheskoy . In various kinds of industry, the most widely spoken first method. One of the special cases — is to fill a variety of polymer components [5-6]. The technological process of adding filler to the polymer nazyvaet¬sya content. The filler content can vary widely prede¬lah, most often it is 40-50%. Plastics filler content in which three or more times greater than the polymer content are called highly filled plastics . 1) Mechanical mixing of the polymer with fillers. 2) Precipitation from a solution of the polymer on the filler surface. An example of the first process for preparing highly filled plastics is shown below. — Trimming the length and width of the division (if required) . Another group consists of food production waste (spent grains, distillery grains, husk), less toxic, but large in terms of education. These wastes or simply merge, due to the inability of the enterprise process it, or used as a fuel (husk), the products of combustion which pollute the environment. If we talk about the timber industry and its waste (chips and sawdust), it is also proper recycling of this waste is not [4,5]. Relevance of integrated waste management by recycling chemical industries in the building materials and related products primarily to the problems of preserving the environment — they are not subject to rotting, corrosion, but also with the problem of resource. Especially promising direction is to obtain utilization of highly plastic, which can be used as building composite materials. It is known that the main aggregates to produce composite materials are screw presses (extruders) . To this end, we have developed an integrated approach to waste management of chemical plants, food and wood processing industry by manufacturing composite materials by extrusion. We have proposed technological scheme for environmentally sound waste material based on chemical, food and wood industries extrusion (Figure 1). КНЕК.ПОЛ.ПРОД, — the total amount of the product obtained from substandard raw materials. 1. Gulak, M.Z. Technology for producing wood-filled polymer composites (WPC) of cellulosic raw material by extrusion / V.D. Bashirov, I.D. Alyamov, R.F. Sagitov, A.A. Petrov / Problems of development of agribusiness in the region: a collection of articles scientific journal. Number 1 (13), 2013. - Pp. 63-70. 2. Bashirov V.D. Economic efficiency of new technological object / V.D. Bashirov, M.G. Baryshnikov, Gulak M.Z., Sagitov R.F. / / Economy and Entrepreneurship. - 2013. - № 10 (39). Pp. 521-523. 3. Gulak, M.Z. Classification of various waste products in the extrusion of plastic materials / R.F. Sagitov, / Youth and Science: Reality and Future: Proceedings of the VI International Scientific and Practical Conference / Editorial Board. : T.N. Ryabchenko, E.I. Buryanova: 2 vols. Volume I: Physical and Mathematical Sciences, Chemical Sciences, Biological Sciences, Engineering, Agricultural Science, History of Science, Philosophy, Philology, Pedagogical sciences, Psychological sciences, Social sciences, Political Science, Cultural Studies. - Nevinnomysk: NIEUP, 2013. - 613. 4. Gulak, M.Z. 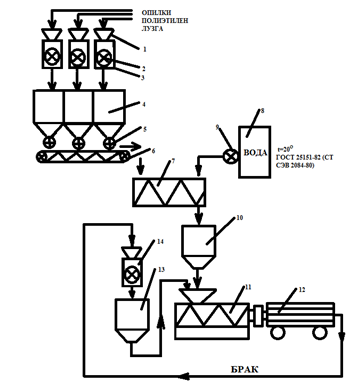 Classification of various waste products during processing by extrusion / M.Z. Gulak / / Patterns and trends in the development of science in modern society: a collection of articles of the International scientific-practical conference. 29-30 March 2013: Part 1 / Min. Ed. L.H. Kurbanaeva. - Ufa RITsBashGU, 2013. - S. 107-109. 5. Gulak, M.Z. Analysis of the distribution of industrial waste / M.G. Baryshnikov, / / Environmental Economics and Conservation: a collection of articles XVI International Scientific and Practical Conference. Penza: Volga House of Knowledge, 2013. - S. 3-5. 6. Gulak, M.Z. Cluster classification of industrial waste / R.F. Sagitov // Environmental Economics and Conservation: a collection of articles XVI International Scientific and Practical Conference. Penza: Volga House of Knowledge, 2013. - S. 32-36. 7. Gulak, M.Z. Analysis of the problem of education and the use of waste as an example of the Orenburg region / V.G. Korotkov, R.F. Sagitov, S.V. Antimonov / / Science and education in contemporary society: a collection of scientific papers based on the International Scientific-Practical Conference November 29, 2013: in 18 parts. Part 12; M of arr. and Science. Tambov Univ TROO "Business Science-Society", 2013. P.60-62. 8. Gulak, M.Z. Analysis of the rational use of waste generated as a result of national economic activity on the territory of Orenburg / R.F. Sagitov, S.V. Antimonov / / Innovations in science / Sat Art. Materials XHX mezhdnar. scientific-practical. conf. Number 2 (27). Part I. Novosibirsk:. "Seebach" in 2014. Pp. 118-123.